Did They Win or Did You Lose? I feel bad for Chris Paul. I do. But I don’t feel bad for the Clippers. I don’t. 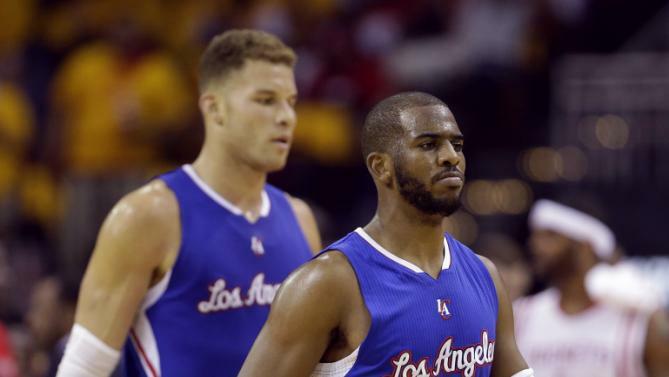 I don’t feel for the Los Angeles Clippers, the team, but I do feel for Chris Paul, the point guard dream. The Houston Rockets defeated the Los Angeles Clippers today in a Game 7 that didn’t have to be. The Clippers, coming off of that dramatic Game 7 win over the defending Champion San Antonio Spurs in the first round, hammered and humiliated Houston and had a three games to one LEAD in the series. Three to ONE! And so the question is this: did Houston win or did the Clippers lose? Did I mention that Chris Paul and Blake Griffin had a three games to one advantage in the series? Yet and still they lost three straight as the lead slipped through their fingers, slid through their hands and slithered through their arms. The good news is that Chris Paul did his part. Paul played his heart out in Game 7. The bad news is that he had little to no help. The lead was cut to three late in the third quarter but somehow it ballooned to 20 early in the forth as the players purportedly and supposedly positioned to support Paul failed, flopped and fizzled. Truth is, the Clippers got clipped and zipped and stripped of a series win en route to a huge let down loss. Too bad. Truth be told, they choked. They croaked. They got smoked. And the Clippers lost more than the Rockets won. And it was a team loss. Other than Paul, with an honorable mention to DeAndre Jordan, no other player on the Clippers had the zip or the zeal needed and necessary to win a Game 7 on the road. And the Clippers coach, Doc Rivers, who is a good coach, got out done by his counterpart Kevin McHale. For all of you youngins out there, McHale made his mark with Larry Bird and Robert Parish and the Boston Celtics back in the ‘80s when I was growing up. McHale has the heart and the mind and the soul of not only a winner, but a champion. So lest we’re too hard on Doc Rivers and Blake Griffin and the rest of the “Trippers,” I mean the Clippers, let’s take a long look in the mirror. How many games have you and I lost when the other team didn’t win? McHale and Houston had the heartiness and the headiness to come back from an almost insurmountable deficit. The Rockets won as a team; they had rich players and role players all doing their part to overcome overwhelming odds to win while the Clippers withered and waned their way to an offseason of whining and wondering. So let’s learn the lesson. Yes its hats off to James Harden and the Rockets. They put together a classic comeback win that was well deserved. But sometimes the other team doesn’t win; sometimes you just lose. So when you’ve got your enemy down, you best bet you better knock them out.